As usual, it is always a difficult task for me to pick up a recipe from my ever-growing to-do list of cakes & bakes. I was thinking of making some Japanese melon pans, but decided against it as it will take up quite a fair bit of time and effort...then I thought maybe I should make a blueberry crumble cake as I just bought another 2 packs of fresh blueberries. I had better luck this time with this Early Grey Chiffon cake. The recipe is original meant for a Japanese green tea chiffon. I replaced it with Earl Grey as I have been looking for a similar recipe that will suit my small chiffon pan. The steps involved in the making of this cake is similar to other chiffon cake recipes. To ensure a very stable oven temperature, I preheated the oven 20mins earlier. By the time the cake was ready to bake, the thermometer registered a temperature of 190degC, once I popped in the cake, the temperature started to drop...it went down to 170degC, just the right temperature! I left the cake to bake for 50mins, I don't understand why this recipe calls for baking the cake for such a long time as compared to others, which usually would take about 30-35mins. When the cake was in the oven for about 35mins, I couldn't help but to open the oven door to slip in an aluminium foil to tent the top, although it was only slightly browned. This caused the oven temperature to drop by another 5 degC. Fortunately, the cake rose beautifully in the oven, it almost reached the tip of the tube...however, towards the end of the baking time, it started to shrink and upon cooling, it was slightly under the rim. If you like Earl Grey tea, I bet you will like this cake too. The fragrance from the Earl Grey was so prominent that it was as if I had a cup of hot Earl Grey tea by my side. I must say this is by far the best chiffon cake I have made...not in terms of flavour, but rather, the texture of the cake was very good. The cake was light, soft and yet 'springy'(I'm not sure whether this is the correct term to describe it though!). To me, this recipe is certainly a keeper. On the other hand, both my kids didn't like the cake at all...the younger one tried his very best, and yet he could hardly finish one small slice of it, he told me that I shouldn't have used 'pepper' to make the cake, lolz! Drizzle in the oil, whisking at the same time till the mixture is well combined. Repeat the same with the water. Sieve over the flour mixture and whisk until flour mixture is fully incorporated into the batter. Add in the earl grey powder and mix well. Note: you may replace Earl Grey tea with other tea of your choice, like matcha or green tea. If the tea leaves are coarse, use a mortar and pestle or a grinder to grind it till fine and powdery. Hey HHB, this chiffon cake looks perfect, good job. I shall try to use osmanthus flowers instead, simply love the fragrance. 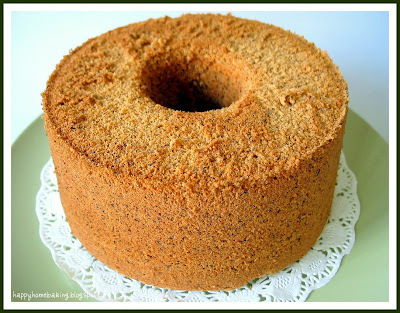 Hi HHB, you've got a perfect chiffon cake! I love Earl Grey tea flavor and believed that this cake must be very delicious! The height of that cake is just splendid! Hi Grace, your beautiful chiffon cakes have inspired me to try this out! Aimei, it's a guessing game...trying to adjust my oven temperature :( The unmolding part is quite simple, just make sure u use a 'ultra-thin' bladed knife. Hi Ida, thanks! For this cake, I used Dilmah teabags. Next time I will try with Twinings. That looks like an immense success! I'm so glad that it worked out for you. And did i mention I love Earl Grey as well. This is a must try!!! Gotta get myself a chiffon pan first of course. A Happy National day to You and all the baking bloggers. What a lovely cake! Your breads are looks interesting. I just recently fell in love with Earl Gray tea, so I think I would like this. Your cake is lovely and looks perfect! Congrats on your success. Pepper? So cute!! Your cake looks perfect....I bet I would've eaten a few slices. 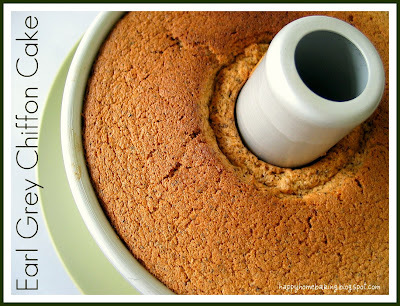 Could i just check what size of eggs do you use for this chiffon cake recipe? I am also one of big fan!! 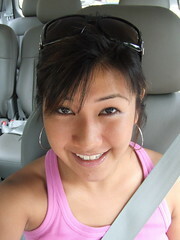 and have been recommending my friends to look up into your blog site. Could you please tell me how you manage to remove your chiffon cake so beautifully. Wow! That looks yummy!! I just found your blog and love it!! Your pictures are divine!! Great job! Redsister, Jacque, Jessica, Eliza, thanks for your kind words. Sherlyn, I am still not able to control the oven temperature...it's pure luck that I get it right this time! Hi Sally, I saw your roast chicken, it looks delicious! Hi Sophia, I used medium sized eggs. Hi Yalia, I use a very thin-bladed knife to remove the chiffon cake. Run it around the side of the pan, try to press the blade against the pan instead on the cake...do the same for the centre core (you may use a long skewer to run around the centre core), the realse the cake and run the knife along the base of the pan. Hello there - I am trying to bake an Earl Grey Chiffon ths weekend, but noticed that cream of tartar has been replaced with baking soda. Hence wondering why so? Hi Katherine, there is no baking soda used in this recipe. Cream of tartar is not used either. I do noticed that most Japanese recipes do not make use of cream of tartar. I'm using microwave oven to bake... but seems like not successful... Could you advise me? Hi Jullie, I baked mine in an electric oven, as such I can't comment on the use of microwave oven. Besides, the oven, it could also be due to other factors. What exactly was the problem with it? I baked this but overwhipped the whites. Nevertheless, the cake still turn out well. Will definitely try it again. You may view the pic here. 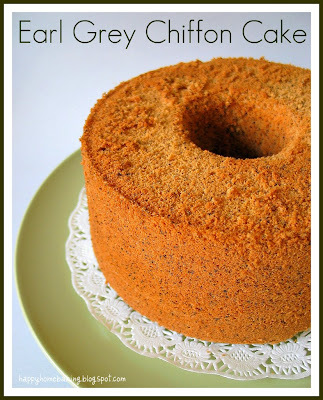 I love this earl grey flavour for chiffon cake, it must have tasted fantastic! Could you advise if I could just replace with 1 tablespoon of orange flavoured paste? Thanks HHB for your quick reply! Lemon chiffon tastes absolutely fabulous! So basically the rest of the recipe stays the same? Only tweak the ingredient which carries the flavour? For this earl grey chiffon, did you just tear open the tea sachet and use the leaves inside? Hi Kristie, I was just playing around with the recipe, and it works fine. For this earl grey version, yes I tear open the sachet and use the leaves inside. The black speckles on the cake are the tea leaves. It taste really good. I made this again and it turned out great! Awesome! btw, I made the orange chiffon cake version, it was really nice, I used abt 3/4 orange paste flavouring, and instead of water, I used orange juice. I think it was a bit sweet and the colour was deep orange. Maybe next time I will reduce to 1/4 orange paste and used the same amount of orange juice. 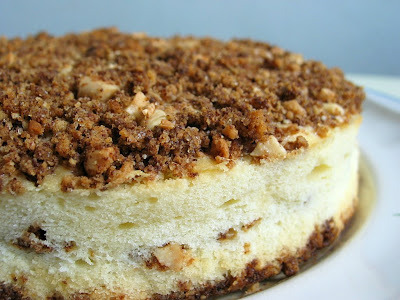 I am looking for a green tea chiffon cake recipe for my 18cm pan and noticed that this recipe is originally it? Do I just substitute the earl grey powder with 1 tblsp of green tea powder and the rest of the recipe remains? Hi Kristie, the original recipe uses green tea Leaves not powder. As such I am not sure how much green tea powder you can replace. If you are using matcha powder, 1 tablespoon may be too much. You can try with 2 tsp, howeever, since I have not tried it, I am not able to comment on the outcome. I will give the green tea powder a try. 1) cake flour with top flour? 2) vegetable oil with sunflower oil? I went to a remote island in Japan for an internship and was asked to come up with some new recipes which make use of the island's local herbal tea. It was very fortunate for me to come across your recipe. The cake turned out surprisingly good despite the fact that I cooked it with rice cooker. Hello..i've actually tried baking a couple times of the chiffon. sometimes it turn out good but sometimes it tend to collapse like as if the top is too heavy. may i ask what is the reason? is it because the temperature was not controlled well enough? how did you managed to get such perfect looking chiffon cakes? it's so defined and beautiful! and may i also ask why you don't need to grease the pan? Thanks! Love your blog! It's fantastic! May I just ask where can I get the smaller version of the chiffon pan? I could only get the huge ones. Hi Michi, I got my chiffon cake pan from Phoon Huat. your cake looks amazing! I would like to make this cake with a Lavender topping! do you know a good recipie for one please :)I want it to be a really smooth topping.. thanks in advance. Hi Annie, I'm sorry, I have never made any chiffon cakes with toppings as I grow up eating plain chiffon cakes ;p Sorry I am of not much help here. 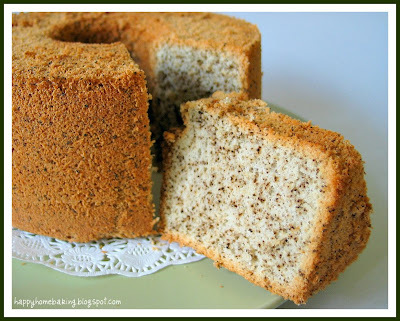 I came across your blog when looking for an earl grey cake and this recipe looks great! And what I thought more interesting was that you're from Singapore. I too am Singaporean but live in the Bay Area. I look forward to trying it out and reading more of your blog posts! Happy baking! I've tried baking the chiffon again. This time it turned out so yellow. The last time I made was more white like the picture you have. May I ask was it due to the colour of the egg yolks? Should I use less egg yolks and more egg whites? Hi Michi,I don't think it is the yolks, it could be the tea you are using. Did you use a different type of tea leaves? hihi HHB, can you recommend the brand of the earl grey tea powder that you use and where to obtain? thanx lots! Hi sushi, I use Dilmah teabags which is available at most supermarkets. If I am not mistaken, the Dilmah teabags contains tea leaves. In the recipe above, you mention tea powder. Did you grind / blend the tea leaves? I always order earl grey when I am at coffee cafe. So yupz, I am quite a fan of earl grey and your photos look very appetizing to try. Keep you posted. Smiles. Hi HHB, i've been following your blog's recipes on this Chiffon cake. Eventually i used green tea powder and substitute 30ml with milk n 45ml water. not sure wat happened, the cake collapsed during the baking time in the oven. Could u pls advice me where did it goes wrong? Hi Jennifer, I am really not sure what went wrong as it could be due to many factors. It could be the oven temperature or the beating/folding of the egg whites. Was there any problem when you follow the original recipe? Thanks for guiding me back to this recipe via the recipe link. Can I check with you, whether I can use other type of flour such as plain flour or self raising flour instead of cake flour? Hi Sushi, you can use plain flour (same amount), but cake flour will give a better texture as it contains less gluten. As for self raising flour, since it contains baking powder, which is not called for in this recipe, it may not be appropriate to use it. You can visit this site www.joyofbaking.com to look at how to substitute plain flour with cake flour. I made this cake and it was absolutely delicious!! My pictures aren't as pretty as yours though. I tried this recipe yesterday and it worked! It's my first successful chiffon cake. Thanks for sharing! Just wonder how come you don't use cream of tartar to beat with the egg whites and sugar? i'm confused!! Hi, it is not necessary to use cream of tartar to beat egg whites. Some of the latest chiffon cake recipes I tried even omit the baking powder. Oh i see.... Thanks for sharing :) I will try your chiffon making. I was sad the day before i came across your blog, i took a recipe of making banana chiffon from the website and it turned out to be awful! Hi, yes you can replace it with earl grey tea, just remember to leave it to cool off before using. Thanks for sharing. Tried baking this yesterday (1st time baking Chiffon Cake) and it was a success. I love your blog! I found it because of this recipe, and I just baked it and it's amazing! thank you so much! Souma, thanks for trying out this recipe :) Your photo of the cake looks lovely! I've tried out your recipe and it tastes fabulous!! Only thing was I used a bundt tube pan and had a little difficulty unmoulding. Will buy a proper 'chiffon' pan and try again.